Please start your APRIL 2017 posts here . . .
Wonder what's up with the egg in front? Been checking here every day to see how things are. Almost always taking a nap. I saw your comment about that one egg, Heida. Didn't know what you meant, but noticed it a little after 10:00 this morning. Still not able to get the first cam view or sound. Little Dad has been there for a while. Was hoping he'd bring that wayward egg back with the others, but he hasn't. Perhaps they know there's something wrong with it? Wish the cams could be corrected, but we might have to wait until Monday. glad all is still well. I see you're puzzled by the location of that one egg, Terka. I've seen some comments elsewhere today about the same thing. 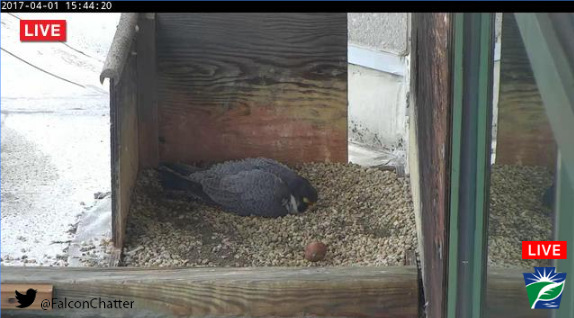 That egg has been out front like for a good 8 hours, and I doubt seriously that it will hatch. Took advantage of the beautiful weather today for a LONG overdue falcon fix. Niecey was on the point when I got downtown around 5:30. She flew down Market Street shortly afterwards, and was circling the U Building a couple times. 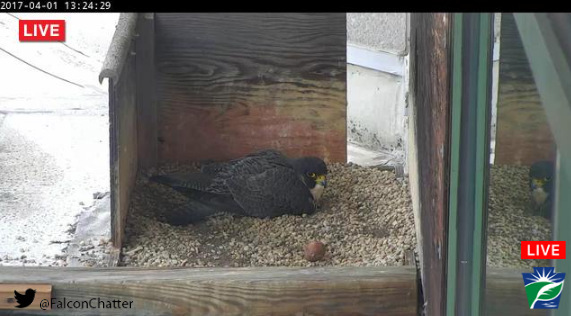 Somewhere around 6:00 there was a nest exchange, and Little Dad came to the point. A man was asking me a bunch of questions as I watched from near the one bus shelter. Missed seeing Little Dad fly over to the steeple, so went up on the roof of the Chestnut Street garage for a better look. He didn't stay on the steeple very long, and flew out toward the State Street Bridge before returning to the point. I did not see any signs of any intruders while I was down there. Am not able to get ANY of the cams right now. Black screen with a spinning circle. From the small thumbnails under the screen where the larger picture comes on it looks like Little Dad is on the eggs and Niecey on the point. All cams seem to be working now. Thanks to those involved in getting this corrected. Having trouble with the cams again. Pictures are freezing and refreshing every 5-10 seconds. Very jerky. VERY jerky picture right now, but can see Little Dad on the point working on a Flicker. All cams are down for me this evening. The cares of tomorrow can wait till this day is done. I was able to get the second view a bit ago from the cam inside the building. Niecey is on the eggs. I'm sure those that are dealing with the cam issues are very frustrated. Cams seem to be working now. Fingers crossed. Niecey is on the eggs. Little Dad is working on a Flicker on the point right now. It's not one of MY resident Flickers.